"Assembled here are some of the most influential and incisive voices examining many of the cutting edge issues in bioethics today. There is much to learn from the contributors, a good deal to debate and a wealth of ideas that merit further research and study." "The editors of this Companion have produced a volume that fruitfully reflects their respective areas of expertise and careers in the field of bioethics. They have thus given us a book that offers students at any level a reliable guide to classical debates in bioethics, cutting edge contributions on issues of global resource allocation, and incisive essays involving gender and the body that are all too often excluded from similar books on offer. I cannot think of a better one-stop-shopping introduction to the field." 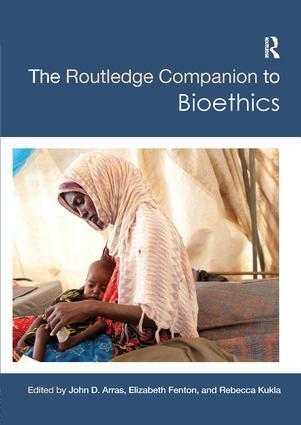 "Erudite and accessible, the new Routledge Companion to Bioethics will be an invaluable resources for students and scholars alike. It provides a window to the field with a sweeping view of pressing issues presented by some of the leading lights of the discipline." "An excellent collection encompassing a broad range of timely issues in Bioethics." Arras, Fenton, and Kukla have put together an interesting, fresh resource on philosophical bioethics. Though they include essays on standard bioethical concerns—for example, the beginning of life, the end of life, biomedical research—they also provide essays on social justice usually treated in volumes on the ethics of public health (human rights, health disparities, population health, and globalization). This is a welcome change. (…) Summing Up: Recommended." John D. Arras is the Porterfield Professor of Biomedical Ethics, and Professor of Philosophy and Public Health Sciences at the University of Virginia. He is a member of the Presidential Commission for the Study of Bioethical Issues. Elizabeth Fenton is a Research Analyst at the Presidential Commission for the Study of Bioethical Issues. She holds a PhD in Philosophy and a MPH, both from the University of Virginia, and completed a postdoctoral fellowship in the Program in Ethics and Health at Harvard University. Rebecca Kukla is Professor of Philosophy and Senior Research Scholar at the Kennedy Institute of Ethics at Georgetown University. She is the Editor-in-Chief of the Kennedy Institute of Ethics Journal and the former co-coordinator of the Feminist Approaches to Bioethics Network.